AEP-PSO Reaches Settlement on Rate Increase? OK-SAFE, Inc. – What OK Corporation Commission staff is making deals with AEP-PSO ahead of the scheduled rate increase hearing, scheduled for June 25th in OKC? AEP-PSO’s June 18th press release on this issue is full of spin. Saying PSO will “offer” Advanced Metering Infrastructure (AMI, aka smart meter) is like saying the Mafia offers protection services. “Take the offer or else…”. 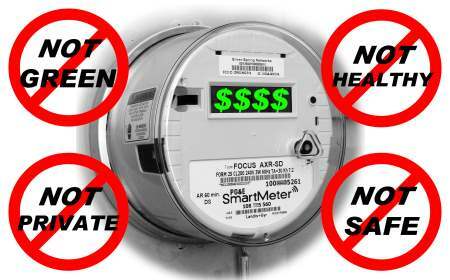 People who have not accepted the utilities’ “offer” of a smart meter have been handcuffed, arrested, or had their power shut off. New tools for customers? That means the installation of a two-way communication device that identifies, monitors and reports what is happening in one’s home. This means reporting what people in their homes are doing, and when; when they’re home, or away. Eventually moving to a time-of-day rating/billing system. Have fun with that. As for the savings advantages, the benefits are all on the side of the utility company. Electric costs for the customer will go up. And up. (This is what has happened when smart meters have been deployed. See here and here. And here.) It is highly unlikely that customers will be able to reduce their energy usage enough to offset the rate increase. 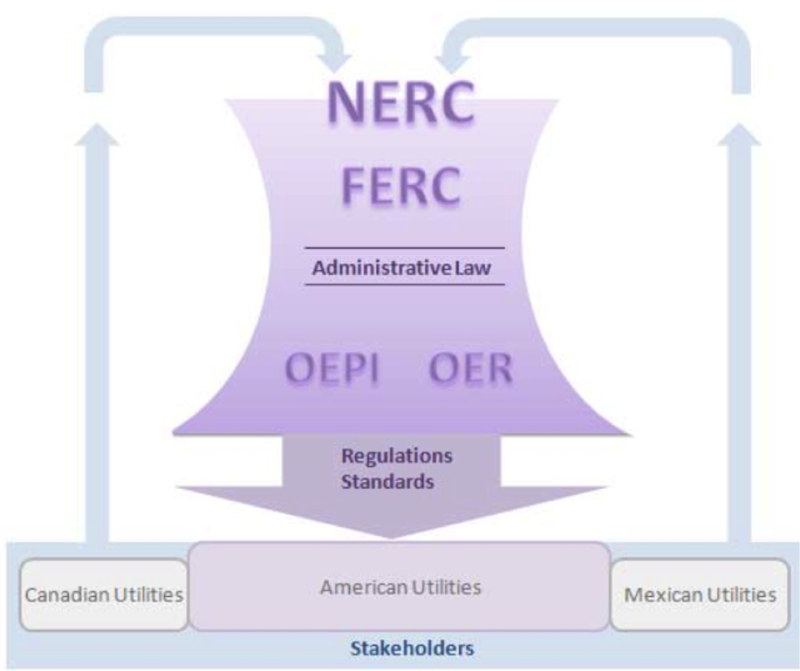 TULSA, Okla., June 18, 2014 – A settlement agreement in the Public Service Company of Oklahoma (PSO) rate case will allow the company to offer Advanced Metering Infrastructure (AMI) for all customers, providing new tools for customers to better manage energy bills. PSO announced plans in November 2013 to begin full deployment of AMI across its 30,000 square-mile service territory, with the goal to replace more than 520,000 existing electric meters with new AMI meters by the fourth quarter of 2016. Customers’ use of the new AMI rate plans and energy management information made possible with AMI will directly contribute to their level of savings to offset the cost of the new meters over time. In addition, customers’ quality of electric service will improve through enhanced outage restoration capability, electronic reading of meters, remote connections and disconnections, and virtual elimination of estimated meter readings. There is a public hearing on PSO’s proposed rate increase scheduled for Wednesday, June 25, 2014 in a court room at the Oklahoma Corporation Commission in Oklahoma City, 2101 N. Lincoln Blvd, in the Jim Thorpe building. The hearing is expected to run several days, if not longer. 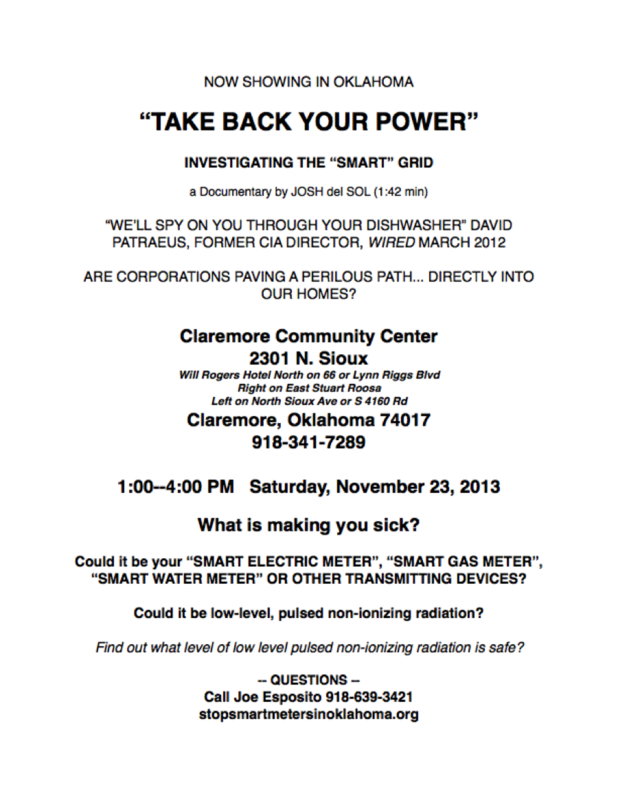 OK-SAFE, Inc. – Concerned about the PSO-AEP smart meter rollout in Oklahoma? So are we. 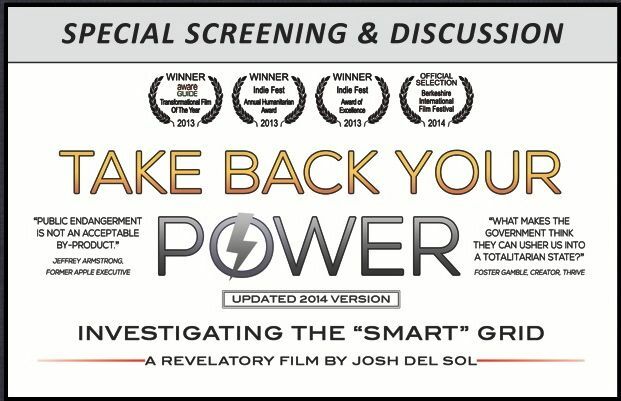 There will be a showing of the award winning film Take Back Your Power on Tuesday, June 10, 2014, at the Hardesty Regional Library in Tulsa. The screening begins at 6:30 pm and is free to the public. Released nationally in 2013, the Take Back Your Power documentary film has won 3 awards, including the AwareGuide Transformational Film of the Year in 2013, and the Leo Award for Best Feature Length Documentary Program in 2014. It was an official selection at the Berkshire International Film Festival, also this year. AEP-PSO announced late last year that they would be replacing their 520,000 analog meters with “advanced devices”, aka smart meters. Work in Tulsa is scheduled to begin in 2015. Sometimes call “spy meters” due to their inherent surveillance capabilities, there is a growing body of evidence that exposure to these type of meters causes serious health issues. This, in addition to the concerns about the corresponding rate hikes wherever smart meters have been installed (here and here), is adding fuel to the fire of opposition to the whole smart meter/smart grid rollout. Invite your friends and neighbors to this showing. An action plan will be presented at the end of the presentation. OK-SAFE, Inc. – Prepare to be sick: Public Service Company of Oklahoma (PSO) leadership has approved the full AMI (Smart Meter) deployment across their 30,000 sq. mile service territory. This means another 522,000 smart meters are coming to a neighborhood near you. · Accessible account information – energy use and price information will be accessible by customers via an on-line web portal. · Enhanced energy management – data available to customers will empower them to more effectively control energy use. In addition, customers will be able to participate in voluntary energy efficiency and demand reduction programs. · Improved outage restoration – remote connection abilities will enable PSO to detect pocket outages, leading to more efficient response times. · Enhanced customer service – quicker response to services including remote meter reading and service connections performed within seconds. The AMI portion of the gridSMART program has already been implemented in Owasso, Sand Springs, Okmulgee, and at the University of Tulsa campus. A total of 31,500 advanced digital meters were installed. “This program has helped many customers in our pilot areas control their energy usage and has led to greater customer service and increased customer satisfaction,” said Derek Lewellen, manager gridSMART and MRO. But customers aren’t the only ones benefiting from the cutting-edge technology. There are many benefits to PSO as well including fewer trips made to access customer facilities and more efficient outage restoration. To voice your opposition to this planned deployment you may wish to contact the Oklahoma Corporation Commission. Tulsa County – A hearing on concerns associated with the forced use of smart meters in Oklahoma will be conducted in Tulsa County Court House on Thursday, October 31, 2013. In additional to the Constitutional question on the infringement of rights, Owasso resident Joe Exposito has serious concerns about the HEALTH/SAFETY/PRIVACY issues associated with the controversial meters. 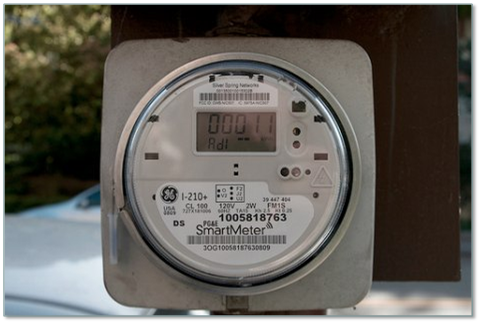 During the spring/summer of 2013 this Tulsa County resident obtained a permit from Tulsa County to replace his new Smart Meter with a standard analog electric meter. Returning to the traditional style electric meter was necessary to counteract the numerous negative health effects Esposito began experiencing after the new Smart had been installed on his home. Even though properly permitted to do so, PSO responded to the change in meters by turning off power to the home for 66 days, during the hottest days of the summer. The resident’s attorneys negotiated with PSO, working out a compromise that restored power to the home for a few months (by by-passing the meter and averaging the utility bill). However, a more permanent solution could not be reached. PSO is again threatening to turn off power to Esposito’s home, due to his continued refusal to accept a Smart Meter on his home. The resident’s Constitutional concerns will be heard at 1:30 pm in the District Court of Tulsa County on Thursday October 31, 2013 by Judge Rebecca Nightingale. The Tulsa County Court House is located at 500 S. Denver, in Tulsa, OK.
OK-SAFE, Inc. – For those fighting the installation of those smart meters on their homes and businesses: Take Back Your Power. There will be a special movie showing at 6:30 pm this Thursday, Oct. 3, 2013 at the Owasso Community Center, 301 S. Cedar, Owasso, OK, 74055. What you discover will surprise you, unsettle you, and inspire you to challenge the status quo. Click here to see more. Are corporations paving a perilous path…directly into our homes? What is making you sick? Could it be your “smart electric meter”, “smart gas meter”, “smart water meter” or other transmitting devices? 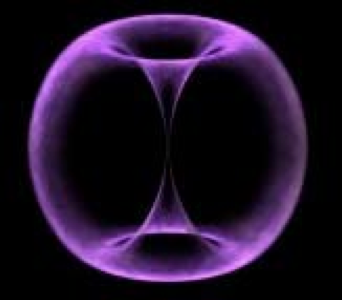 Could it be low-level, pulsed non-ionizing radiation? 2/20/13 UPDATE: Red Dirt Report has just posted an update on this incident and fills in some blanks, including comments by OG&E spokesperson Karen Kurtz, who confirmed the incident, while claiming bringing the 3 officers was not a “show of force”. So, showing up with men with guns and handcuffing homeowners in their front yard is not a show of force? Huh? “Guthrie man still “smarting” after police detainment after refusing new “smart meter”. OK-SAFE, Inc. – 2/20/13 – In a developing story it looks like 3 local police officers were used as a show of force when they accompanied an OG&E technician in the installation of a smart meter on the home of a Guthrie man, against the man’s wishes. The Guthrie man, who is keeping his name quiet at the moment, has been fighting the installation of the spy-meter for a while now, and was surprised by today’s show of force by OG&E. According to local Guthrie officials, OG&E is responsible for the smart meter installation in Guthrie; it is not known at this time if OG&E contracted out the installation to a third party. OK-SAFE, Inc. – More than 50 people attended Thursday night’s meeting in Owasso, OK on the health dangers of Smart Meters. One of the many helpful handouts that night was this list of sources of information on Smart Meters and the associated concerns.